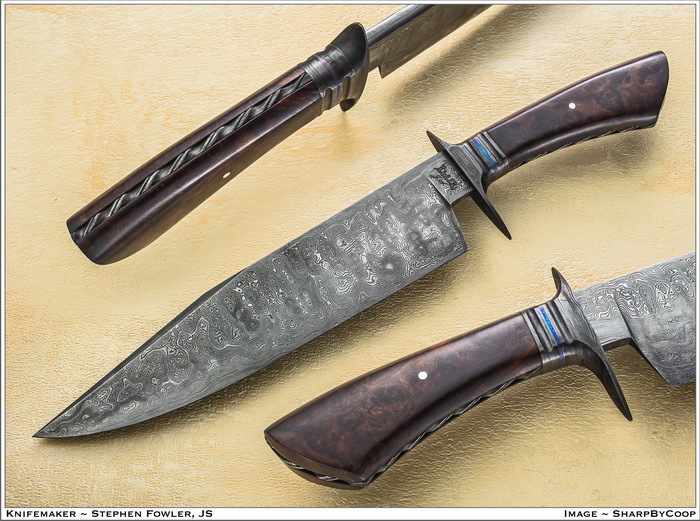 **** Chosen by Winner: Martin O.
ABS Journeyman Smith Stephan Fowler has forged a stunning 600-layer random pattern Damascus Bowie with a 10-inch blade. It is fitted with 600 layer Damascus guard and spacers, along with a bright blue anodized aluminum spacer as an eye-catching accent. The exhibition grade Desert Ironwood handle is framed with hand filed Damascus in a rope pattern. Overall length is 15 inches. FOWLERBLADES are hand forged using traditional blacksmithing methods; using only the highest quality steels for your perfect knife or tool. Stephan finishes each and every blade by hand, paying special attention to details, such as: contours, balance, grain of steel and hone. You cannot and will NOT find a store bought blister package that can compete with the pride Stephan puts into each piece that comes out of his Forge.